Michael Korda was not only an articulate raconteur when it came to describing his family's role in movie history, but clearly showed a sincere love for the remarkable roots of the film business. Korda came to the Darien Public Library for the fourth time on Thursday, March 28, though, in the words of Erin Shea, the library's head of adult programming, "He's a very dynamic speaker and also a really warm person, so we would have him here every Sunday if we could." Korda, who spent decades as the editor-in-chief at Simon & Schuster, has written numerous books, including best sellers "Queenie" and "The Fortune," as well several non-fictions works, including those on Ulysses S. Grant and Dwight D. Eisenhower. At this Darien visit, however, he shared about his uncles' and father's significant role in the history of film, as outlined in his book "Charmed Lives." "For those of you who wonder what `Charmed Lives' is about, it is about a family, but it is about much more. It is about the creation of a magical business," Korda said. "The Korda brothers were born in central Europe and were masters of illusion on the screen and in their own lives." His uncle, Alex Korda, was the driving force, not only writing, directing and producing a number of movies, but establishing several studios in different countries -- including London Films, beginning in the silent era and extending into the 1950s. Among his better-known films were "The Four Feathers" and "The Thief of Baghdad." He was not only knighted for his work, but an award is named in his honor by the British Academy of Film and Television Arts. His brother, Zoltan, who was the director of more than a dozen movies, was also a screenwriter. Michael Korda's father, Vincent, served as art director and production designer for various films, winning an Academy Award for "The Thief of Baghdad" and receiving nominations for three other films. "Each of the three had their own kind of genius," Korda said, noting the challenges of being born not only poor and Hungarian, but Jewish. Korda made light of Hungarian stereotypes, asking the crowd of about 75 if they'd heard the best-known jokes. "The Hungarian recipe for an omelette begins: `First steal a dozen eggs.' 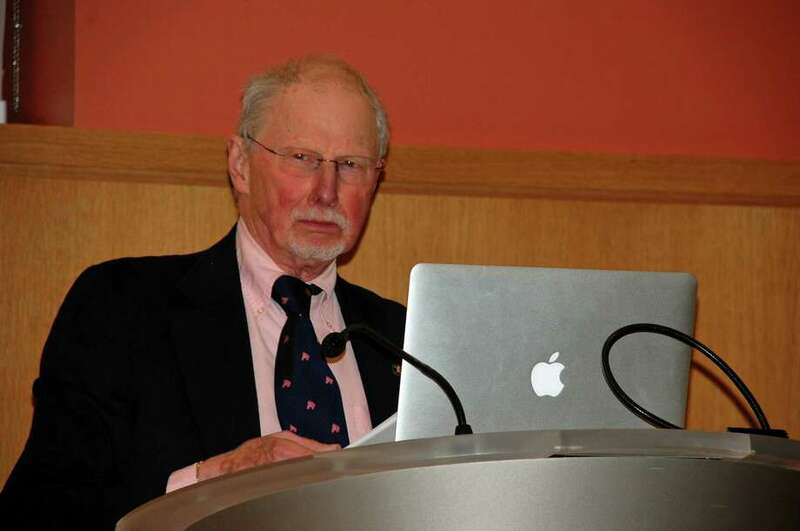 "
London-born Michael Korda showed himself to be an amiable, talkative man before his presentation as well, downplaying any great interest in talking about his work. "I think it's going too far to say I like speaking in public," he said. "I like connecting with people over the books and it's somehow more alive than just sitting and signing them, or for that matter sitting and writing them." He said he doesn't like just sitting and signing books, however, "unless I can in some way speak to people about the book. Just sitting there behind a table seems somehow to me passive, so I like to explain to people about the books." Kris Winge-Sorensen, of Norwalk, was among those who left quite pleased with his presentation. "He was wonderful," she said. "He just has the storyteller's magic." Korda, who resides in Pleasant Valley, N.Y., with his wife, Margaret, offered high praise for the library itself. "First of all, I think it's a terrific venue for a lecture," he said. "Secondly, they're very nice ... and finally, I think it's a wonderful book-oriented audience, so I've always been very happy to come, and very grateful." Jarret Liotta is a freelance writer.